Word is Microsoft's flagship word processing software. Word 2010 is a main component of the popular Office 2010 suite of productivity applications. Note: Microsoft cautions against running any program in its Office suite as a Windows Service. However the most notable problems arise when running in the default LocalSystem account and AlwaysUp can get around that. Nevertheless, please be sure to thoroughly test your setup to ensure that your Word automation works as expected. if you have a 64-bit version of Windows and installed the 32-bit version of Office/Word. In the Arguments field, enter any command line switches you use to start Word the way you like. In this tutorial, we want to launch Word with a a special document, so we specify the /t flag followed by the full path to the document. Please be sure to enclose the path in double quotes (") if it has at least one space. In the Name field, enter the name that you will call the application in AlwaysUp. We have specified Word 2010 but you can enter almost anything you like. Click over to the Logon tab and enter the user name and password of the account in which you installed and configured Word (or Office) 2010 - probably the one you are logged in to right now. Word must run in this account so that it can find its configuration & settings. It will not operate correctly if no account is set here! Click the Save >> button. 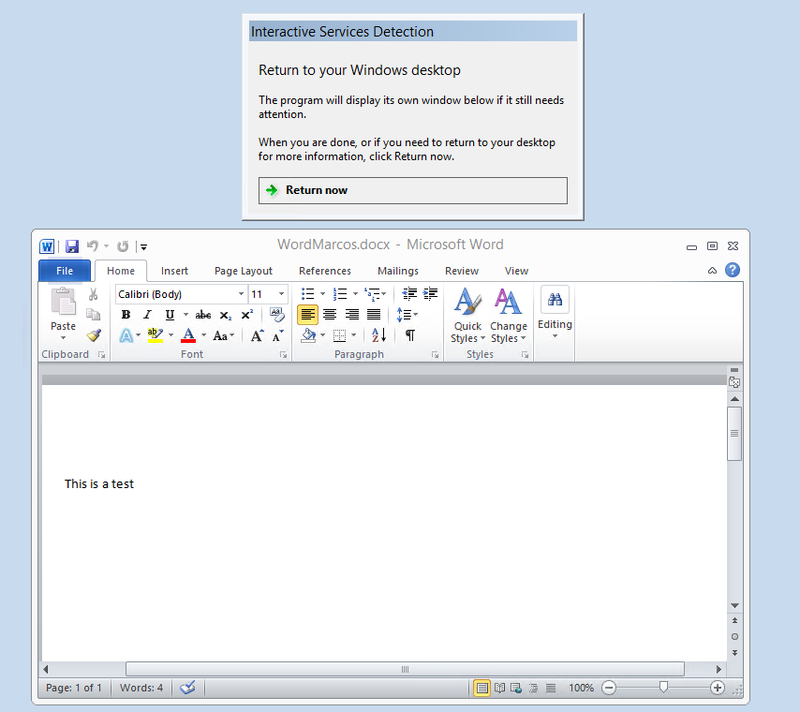 In a couple of seconds, an application called Word 2010 (or whatever you called it) will appear in the AlwaysUp window. It is not yet running though (the State will be Stopped). 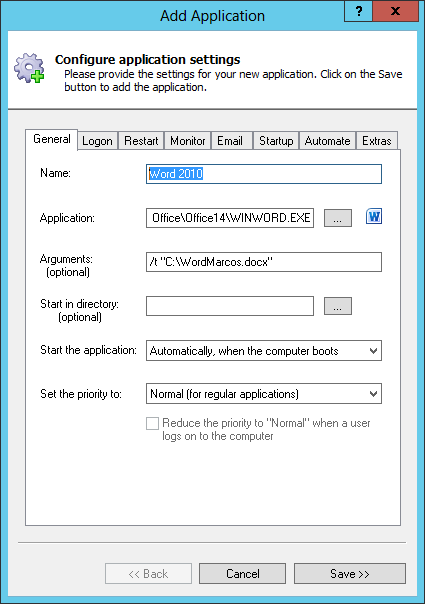 You can also choose Application > Start "Word 2010" in this Session if you wish to start Word visible on your desktop. That's it! Next time your computer boots, Word 2010 will start immediately before anyone logs on. We encourage you to edit the application in AlwaysUp and check out the many other settings that may be appropriate for your environment. 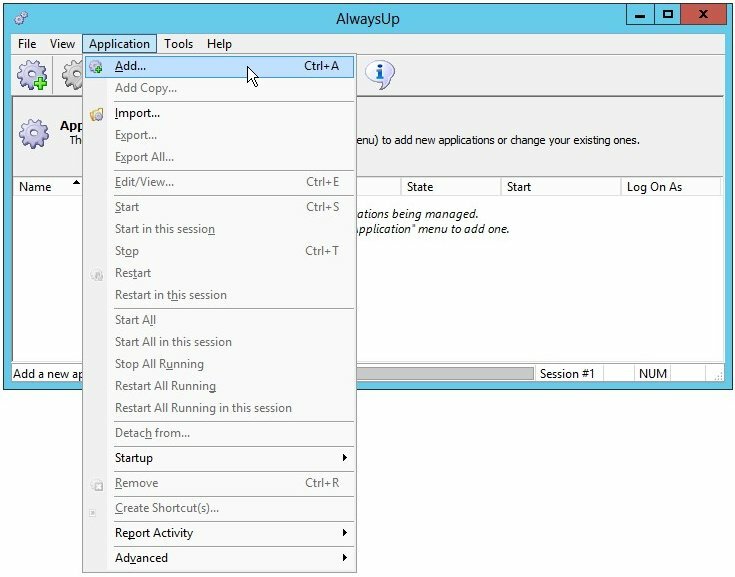 For example, configure AlwaysUp to send you an email whenever Word 2010 starts (Email tab), or restart Word 2010 periodically at a safe time to keep it "fresh" (Monitor tab). Word 2010 not working properly as a Windows Service? From AlwaysUp, select Application > Report Activity > Today... to bring up a HTML report detailing the interaction between AlwaysUp and Word. The AlwaysUp Event Log Messages page explains the more obscure messages. Are you loading a document from a network drive? Please check the Attempt to automatically reconnect all network drives box on the Startup tab. Read more about using network drives in our FAQ.